I have done this particular project two years in a row with the grade 1 class. It is a winner. The kids love it and I always get lots of positive comments from the parents. Cut your fabric to size, I wanted a banner for this one so I cut my fabric the size of a placemat and folded over the top edge to the back and sewed in a seam. This will hold my branch. You could also cut this narrow for a door sign or long and narrow for a table runner. Lots of possibilities. Take one of your leaves and paint it with the acrylic paint. Often the underside of the leaf will produce a better print, the veins show up better. Give it a good coat but you don't want gobs of paint or you won't get a clear print. 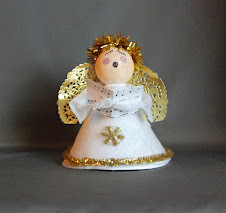 Figure out where you want to place it and then turn paint side down on to the fabric. I tell the kids they can't move it once it is down or they will smear their banner. Take a small sheet of wax paper, place over leaf and then roll the brayer or rolling pin over top. You can use a can if you don't have a roller or whatever the kids use for playdough. The wax paper helps protect the brayer (rolling pin ) from getting paint on it and then inadvertently smearing it on the banner. Use a new sheet of wax paper or turn it over with each new leaf. Make sure to leave some space where your letters are going to go. I also get the kids to put their name and the year at the bottom. While the prints are drying, take your accent fabric and apply the heat and bond to the wrong side. If you don't have Heat and Bond you can just use tacky glue to glue down the letters once you have cut them out. At school I have letter templates made from thin cardboard. The kids trace around them on the back (paperside) of the fabric with the Heat and Bond applied. The hardest part is getting them to trace it backwards so when we iron it it will be in the correct position. Iron into place as per Heat and Bond instructions and you have a great Fall Banner and keepsake for years to come. I love your blog! Happened on it through a line of other blogs! 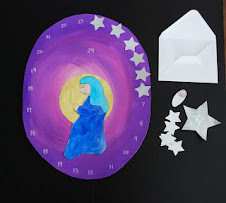 We homeschool and I hope to recreate some of these fantastic crafts you've laid out! Thanks ever so much!! Thanks Sonya. Good luck with the crafts...I'll keep trying to come up with some good ideas. hats off to you for home schooling. I don't know if I could pull it off...everything would end up being an art project! I'm a parent (artist too), working with a small group from my son's kindergarden for the 1st time making a 1-2-3 leaf book out of fabric (their idea). I LOVE this printing from leaves idea (I was a deprived child... never did this stuff). I would LOVE to see more leaf ideas you may have! You are such an inspiration! Thanks! Thank you so much for the great ideas! I especially like the banner and the glue batik. With your permission may I copy and print the instructions to the glue batik and fall leaf projects? Hey anonymous, it depends on what you are using it for. If it's just for your own use or for a school program that is OK. If it's for another blog send me the link to check it out. I love your blog! I sent you an email, but not to sure if you got it, it may have gone into your spam. I have used so many of your ideas as inspiration for art projects in my own classroom. 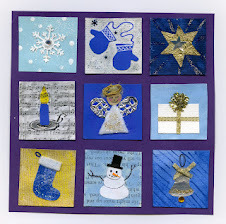 I took pictures of my samples and student work, and have posted on my blog with a link to you as the inspiration. Please check out my blog and let me know if you are ok with this, as I have other projects also inspired by you that I would love to post. Thanks for everything! I love this activity. What type of fabric do you recommend? After doing this project several times during the years I find plain cotton broadcloth or muslin to be the best. It takes the print well. Anything with a nap or texture interferes with the print and anything too heavy doesn't absorb enough paint to show up nice. Canvas is ok but the weave does affect the print. Hope that helps and Good Luck it's a great project. I am going to try this with my daycare kids. The leaves are just turning now to give them a little inspiration. I am retired and have dived in to art journaling and mixed media. 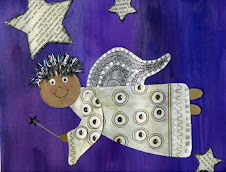 I really enjoy your site and you definitely incorporate various art journaling and mixed media work in your projects. Your work is fresh and very creative.